Successfully pitching a hard-hitting news story during one of the most bitterly contested elections of recent times was, to put it mildly, a bit of challenge. On 1 May 2015, we launched the Stroke Association’s fourth Action on Stroke Month. The overriding purpose of the month is to raise awareness of stroke and get people talking about this devastating condition. In previous years, we’ve launched the month with a policy or politically charged hard news story, but with the 2015 General Election due in early May, we didn’t want our story to get buried beneath a flurry of political news. That’s why, in January this year, we earmarked Tuesday 12 May 2015 as the date to launch our news story. As this date coincided with European Stroke Awareness Day it gave us an additional hook. We also hoped that by this time the election would be over, with a new government in place. We knew we had to tread carefully with our news story because of the rules around purdah. This meant we had to avoid being seen to engage in any form of political campaigning. After carrying out an analysis of available data, we worked up a (non-political) news angle – the dramatic rise in the number of people admitted to hospital for stroke in the last 15 years. The Stroke Association PR team then swung into action. Top of our list was to ‘sense check’ our story with a few of our key media contacts to make sure it resonated. Armed with the knowledge that we had a potentially strong story on our hands, we set about creating that all important buzz. This involved briefing the media, both over the phone and, where possible, face-to-face. We also lined up case studies (stroke survivors of working-age), prepped our spokespeople and made sure that expectations among our directors were properly managed. The election was still dominating the newspapers and airwaves – would there be room for our story? We’d put a lot of time into what we thought was a newsworthy story, but as any PR professional knows, media coverage is never guaranteed. Right up until 12 May, the whole team was on tenterhooks. In the end, our fears were allayed – the results surpassed our expectations, eclipsing anything we’d previously achieved. Blanket coverage was secured across all national print media outlets, including the front page of The Guardian. 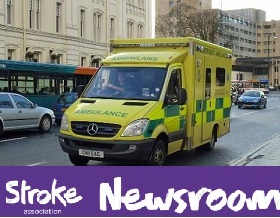 The Stroke Association also went global, with 17 international news titles (in different languages) featuring our story throughout the day. All major UK TV news programmes carried our story, including BBC Breakfast, Sky News, Channel 4 News, ITV News, Channel 5 News, BBC News Channel, BBC News at One and at Six. BBC Radio 4’s flagship Today programme helped to set the tone for the rest of the day’s coverage, with Radio 5 Live, Radio One Newsbeat and Radio 2 also featuring our story. Regionally, we secured coverage on 22 radio stations, 16 TV stations and in 20 newspapers. We also got a strong showing in medical and financial trade media and, thanks to our celebrity supporters, the story reached millions of Twitter followers. Overall, Action on Stroke Month (including our Make May Purple social media campaign) has generated more than 2,500 pieces of media coverage (so far), compared to an average of 1,800 for previous years. However, while the headlines are fantastic, the Barcelona Principles remind us that it’s the impact of media coverage that really counts. We’re still evaluating the impact of our work, but it’s great to see the conversations we’ve kick-started on social media and in different circles throughout the UK and across the globe. For me, the crowning glory was the feedback we received from stroke communities and survivors. Nothing sums it up better than the words of some of the stroke survivors who did a brilliant job speaking to the media about their experiences. Great to have the opportunity to help the Stroke Association and put something back. Taking part in the interviews was really interesting from a personal perspective. I hope I can work with you again." It was enormously rewarding and useful, both from a personal standpoint and from that of stroke education. I had 200 hits on my blog on Wednesday and the interest has continued throughout the week. I will certainly be pushing the cause of stroke education to the people I meet." Anil Ranchod is the creator of Action on Stroke Month. A media relations specialist with over 13 years’ press and PR experience, Anil is responsible for leading and delivering the charity’s cross-functional, integrated, communications-led campaigns. He also manages the Stroke Association’s PR, media and celebrity teams.